The bouquet of prizes Miss South Africa will receive makes the pageant one of the richest beauty competitions in the world. Rolene Strauss – who was crowned at a dazzling ceremony at Sun City on Sunday 30 March – will receive cash, a car and products to the value of more than R1,3 million. She also gets thousands in cash and study bursaries to award to South Africans she meets during her reign. Cell C is also giving Rolene access to R200 000 to spend on random acts of kindness. Varsity College has donated two bursaries valued at R330 000 for Miss South Africa to award to two economically disadvantaged students to study towards a degree or diploma on a full-time basis for a maximum of three years at Varsity College. There are also 10 short learning programme bursaries for Miss SA to award to NGOs or charitable institutions valued at R150 000. The glamour and excitement was broadcast live from the Sun City Superbowl as 12 of the country’s most talented and beautiful women competed to be crowned Miss South Africa 2014. Performers at the glittering show included Mi Casa, Matthew Mole and Bucie. Musical director for the Miss SA pageant is Brendan Jury who will be conducting a 13–piece orchestra. 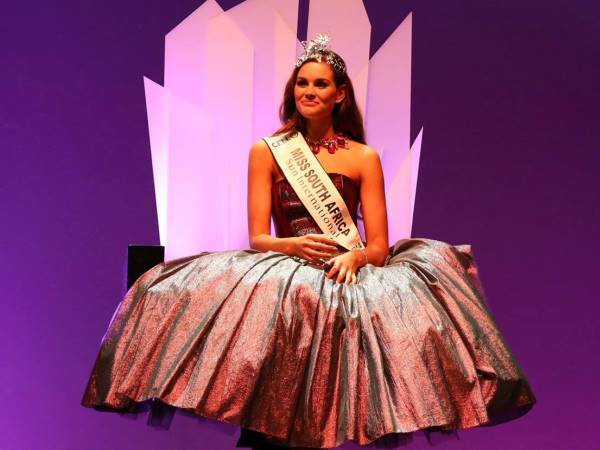 The Miss SA finalists were Abigail de Jager, Mpumalanga; Anzél Stofberg, Western Cape; Caylene Marais, Gauteng; Dipalesa Mbola, Free State; Jade Hubner, Western Cape; Julia Petersen, KwaZulu–Natal; Matlala Mokoko, Limpopo; Mishka Patel, Western Cape; Rolene Strauss, Free State; Tidimalo Sehlako; Gauteng; Tshegofatso Monggae, Gauteng and Ziphozakhe Zokufa, Eastern Cape. The Miss South Africa Pageant was broadcast live onMzansi Magic (Dstv channel 161) on Sunday 30 March from 5.30 pm. Miss SA 2014 is presented by Sun International and sponsored by Cell C.